I’ve died and gone to bargainista heaven. 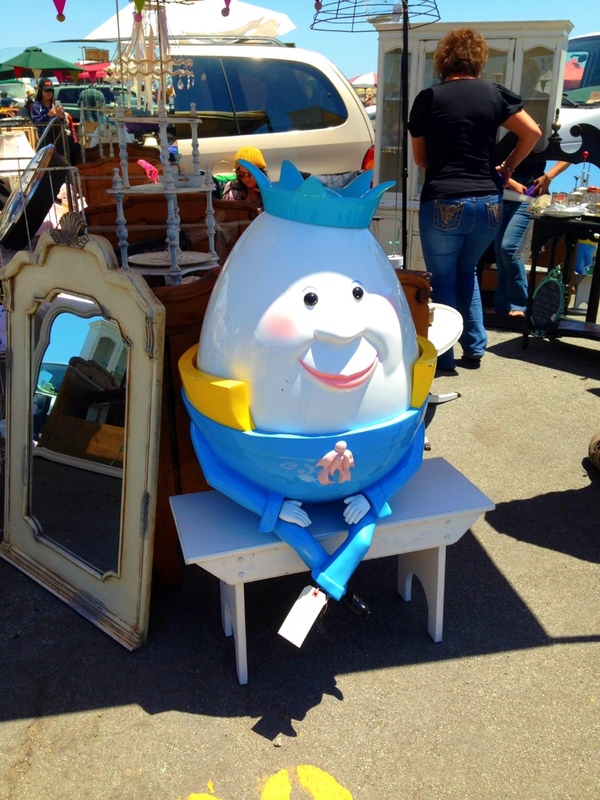 Each month, flea market aficionados from as far away as Washington and Nevada make a pilgrimage to the Bay Area for the muther of all flea markets. 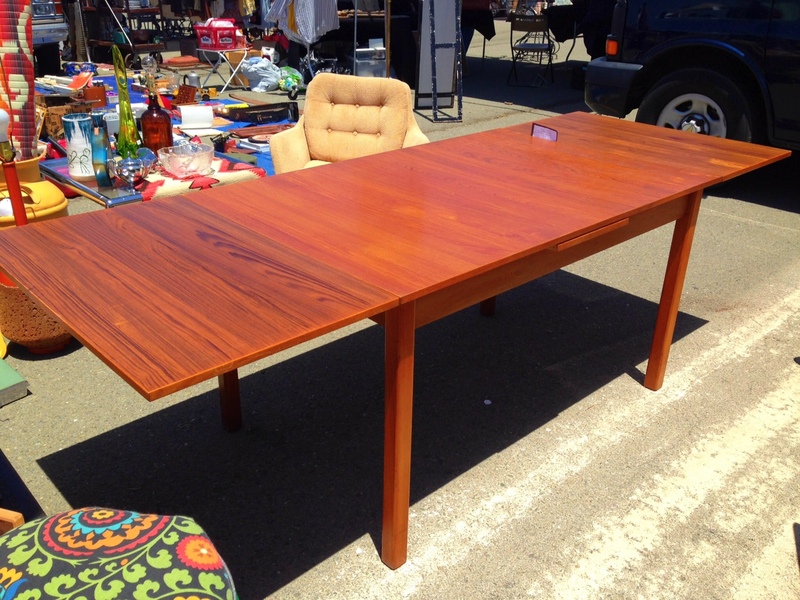 The Alameda Point Antiques Fair (better known as the Alameda flea market) takes place on the first Sunday of each month at Alameda Point, a former naval air station located in the northeast corner of Alameda Island. 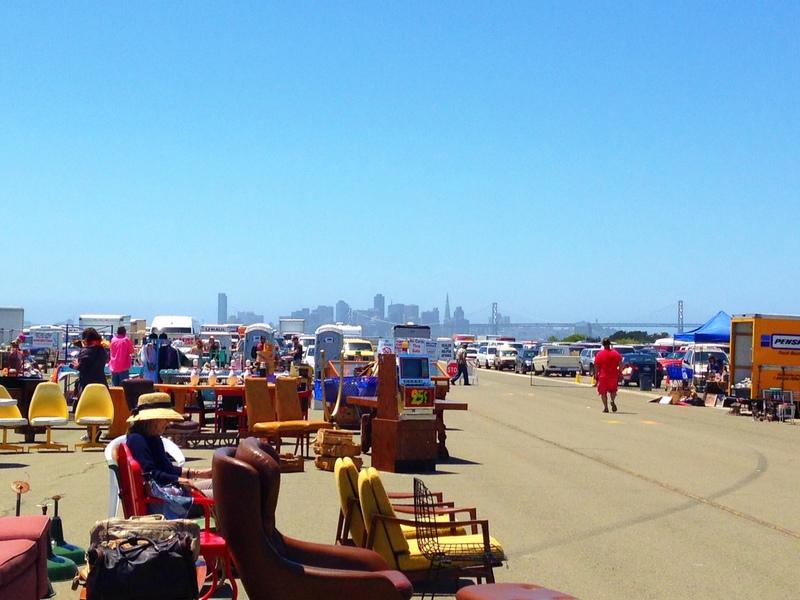 Not only are you given access to some of the best home design and clothing bargains, you’re entertained with a majestic view of San Francisco. The organizers have a policy that limits exhibitors to only sell wares that are 20 years or older. I’m not quite sure it’s as strict as it should be, since I noticed a few stalls selling merchandise that looked new. Still, it’s worth scouring the aisles to find something that gives you bargain bragging rights. 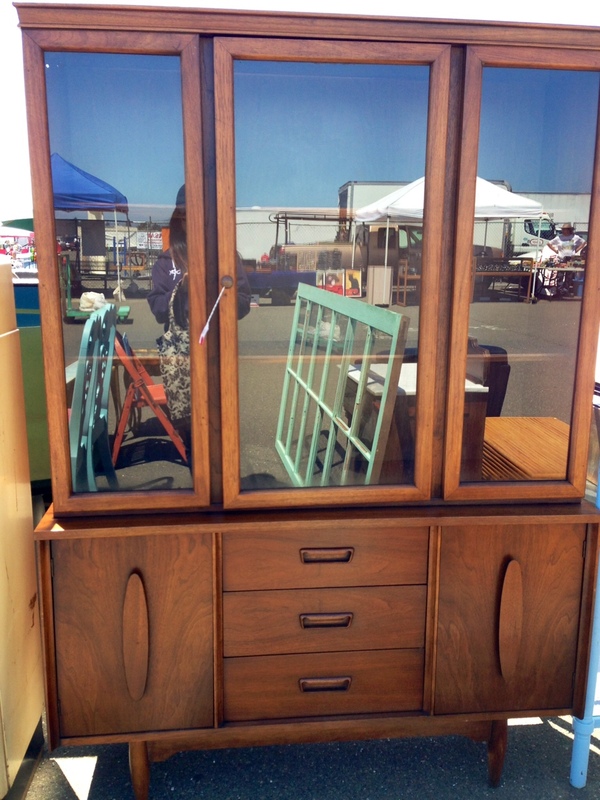 Speaking of, what is this cabinet in the near distance that is batting its atomic accented lashes at me? Hello, hottie! 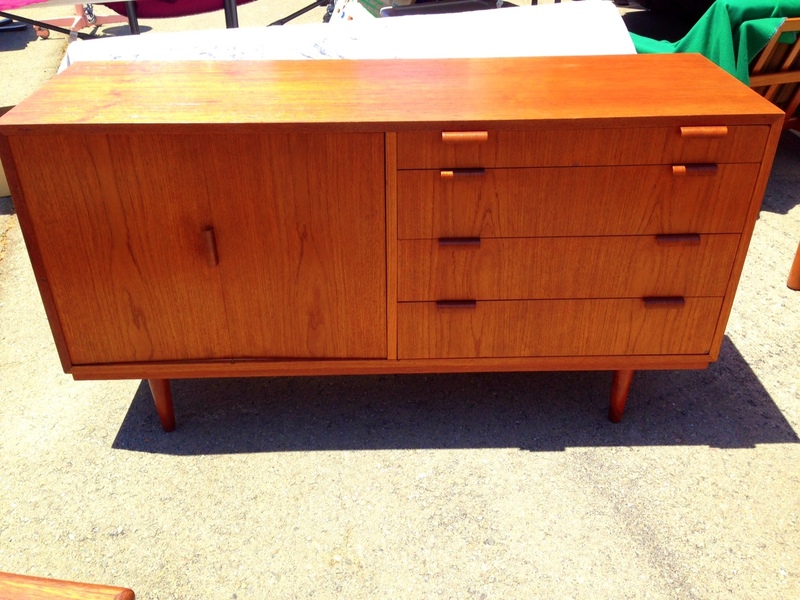 This beautiful mid century teak dining cabinet teased me from the moment I entered the gates. I looked at the price tag and expected something in the range of at least $600 (I adjust my expectation levels to avoid disappointment). To my sheer delight, it was $200. After dancing the happy pickle, I realized that we weren’t really in the market for a dining cabinet, and we had no mode of transporting it home. It was an extremely painful decision to make, but I had to focus on my quest for zen-like minimalism in my approach to home design. Reminders of my former hoarding tendencies made me walk away. I will shed tears for weeks. 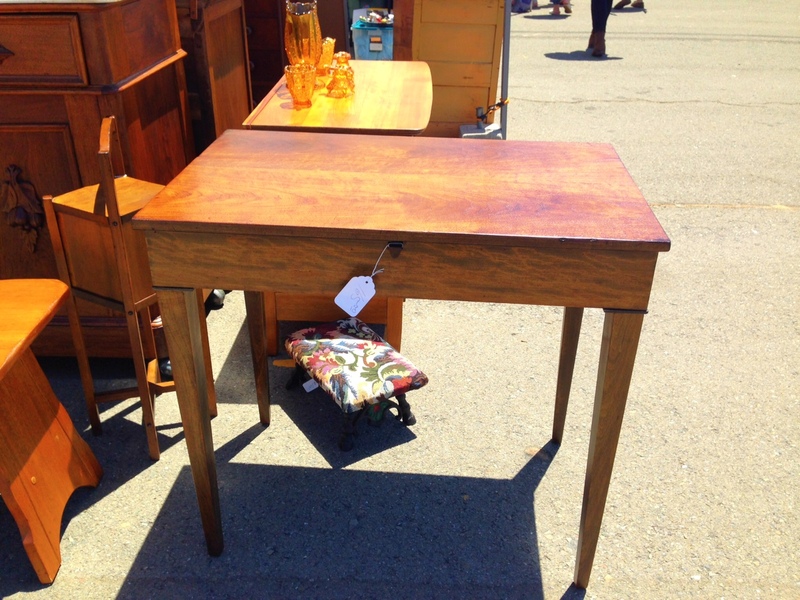 This writing desk from 1919 is made with a beautifully grained walnut. The top slides open to reveal a small storage space. Asking price: $165. I’m guessing that the merchant probably would have let it go for $120. But the dimensions were off for us and once again, I found myself resisting a deal for practicality. There were a few other hotties that caught my eye. Here’s a Brdr Furbo dining table. Asking price: $500. The merchant seemed extremely motivated to negotiate. My guess is that $400 would have made her happy. 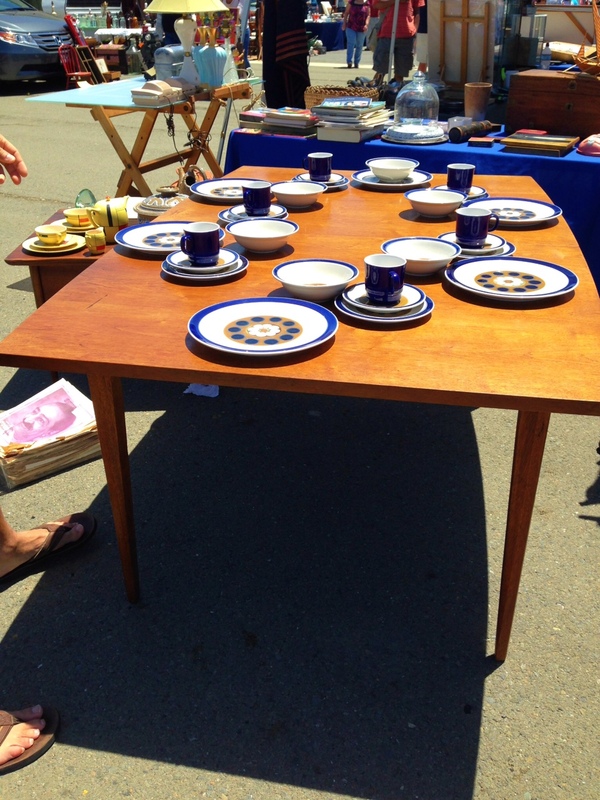 This walnut mid century dining table is missing its leaves but in excellent shape otherwise. I love the extremely subtle curve along each side. Asking price: $225. It would have sold for $150 to $175. …who didn’t have a great fall. In fact, he was already sold by the time I took this picture. 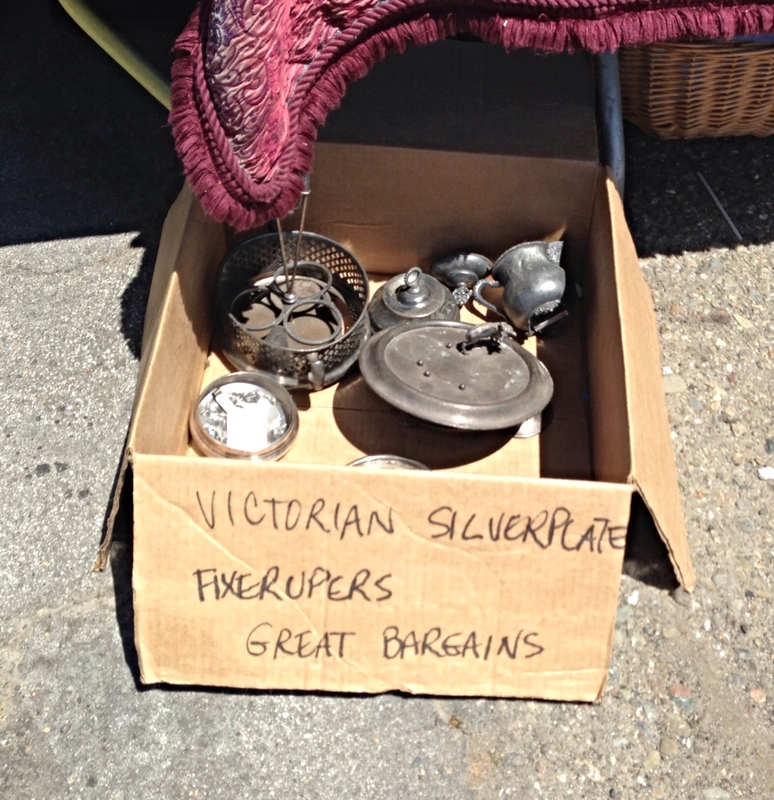 Like all flea markets, there’s a lot of junk to search through in order to find some treasures. 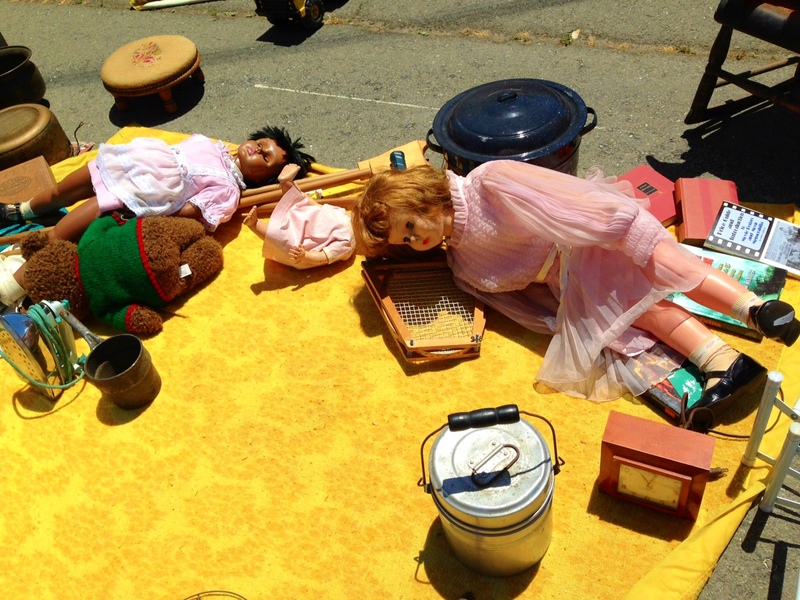 Hug me, mommy, scary dolls lurk. 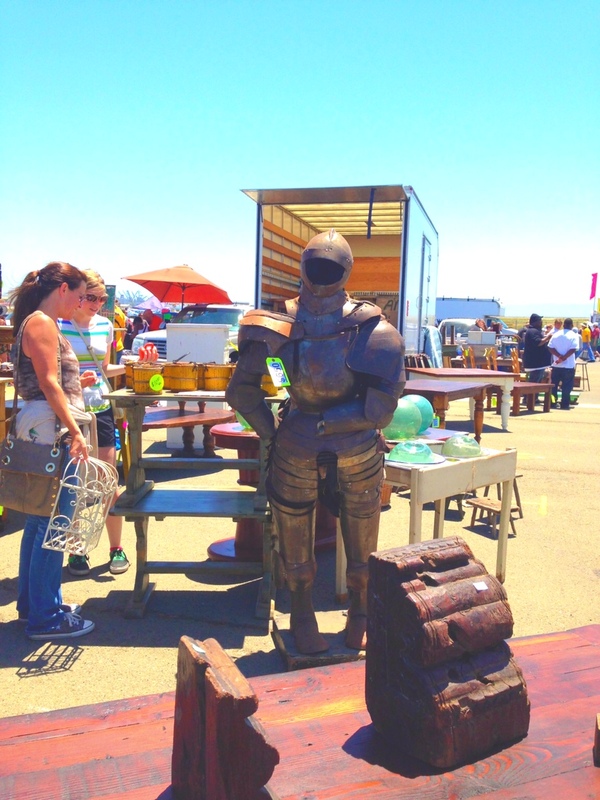 Feeling the need to get your knight on? You can, for $650 (or less). …..some are not. 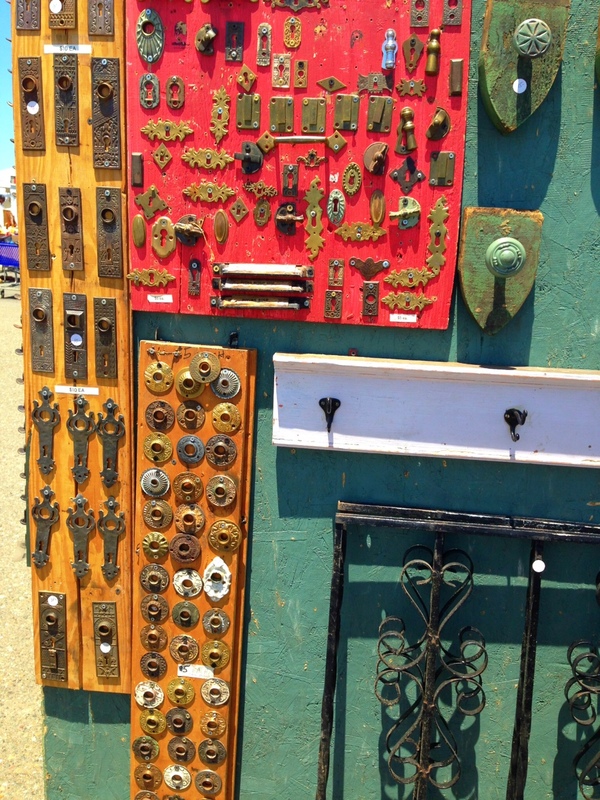 You can find hardware for your period home restoration. And, of course, a chandelier to mix up your ultra-modern space (although I didn’t see any made from unconventional materials). After spending two hours scouring what appeared to be two city blocks of merchandise, it was time to hang up our rummaging hats and call it a day. This is not for the faint of heart; this excursion requires great endurance and will power. Still, it’s well worth the trip and energy when you come across those unexpected finds. Here are some survival tips if you plan to go. 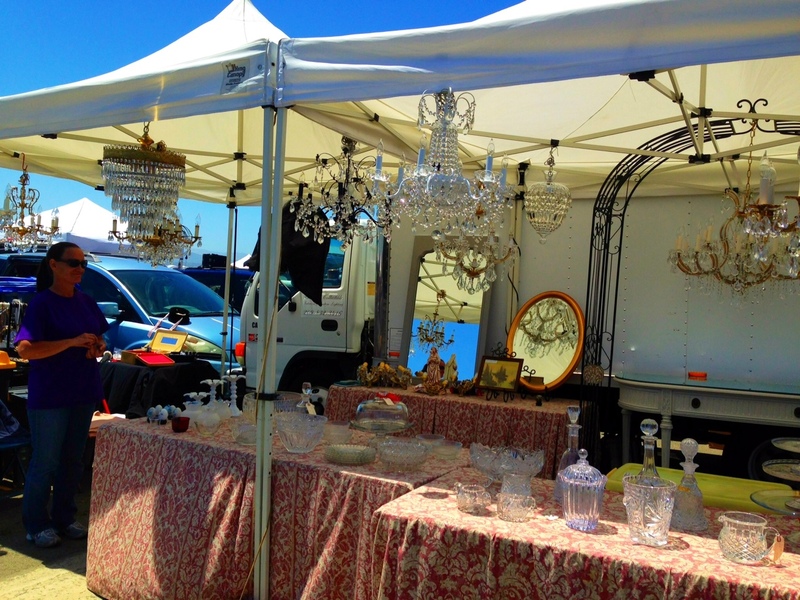 The Alameda Point Antiques Fair is located at 2900 Navy Way, Alameda, CA 94501 and takes place every first Sunday of the month. The admission costs are as follows: 6:00 AM to 7:30 am $15.00, 7:30 am to 9:00 am $10.00, 9:00 am to 3:00 pm $ 5.00. Bring cash- it’ll give you more bargaining power. 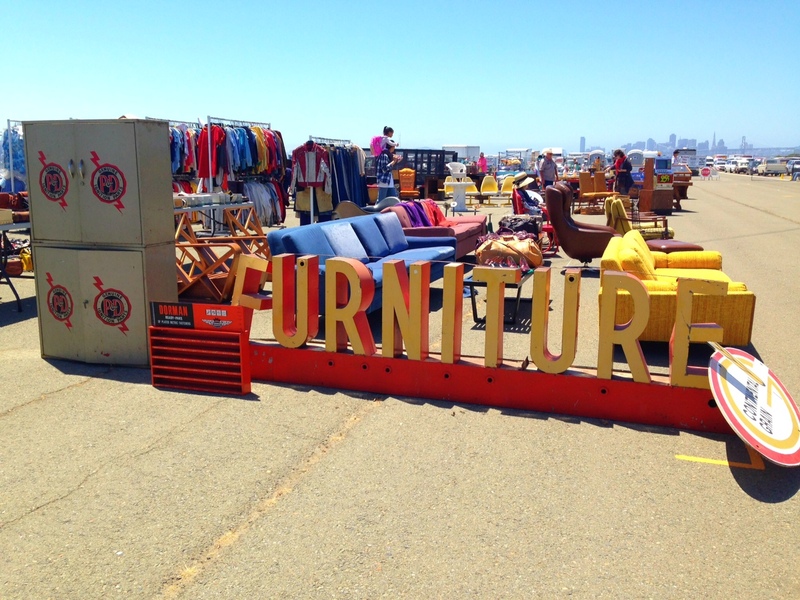 If you are in the market for furniture pieces, rent a U-Haul and don’t miss out on a deal just because you have no means of transporting it home. The cost of the U-Haul (about $50) is small compared to the loss of a great bargain. Please learn from my mistake! Earlier shopping hours get you access to better merchandise, but if you go later in the day, merchants are more willing to negotiate on price to get rid of their wares. Parking is free. Remember the alphabet of the aisle where you parked so you can easily find your car post shopping. During sunny days, bring a hat, sunglasses, and bottled water. You can rent carts and six-wheelers to haul your crap around that you’ve purchased. Start in the far back area where they give booths to the occasional – not seasoned – exhibitor. You’ll get your best bargains. Don’t miss any aisles. If you go, go for the long haul. Go big, or go home. Traffic getting back to the city is nightmarish if you leave after 1 pm. There are food trucks along each far side for lunch breaks or hunger pangs. Don’t rush through it and ENJOY the hunt for your next big bargain! 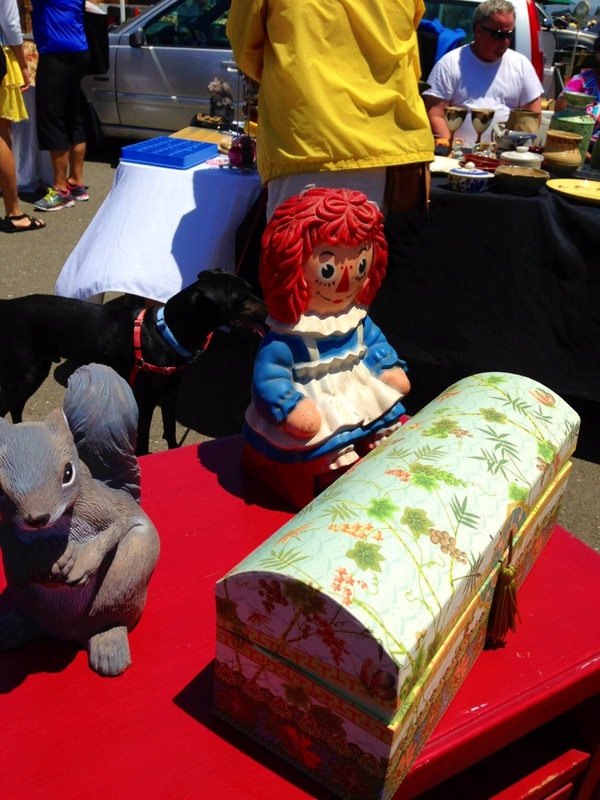 If you’ve been to the Alameda Point Antiques Fair and have some tips you’d like to share, please feel free to do so with a comment. Thank you! Loved this blog!!! Thanks for the tips! 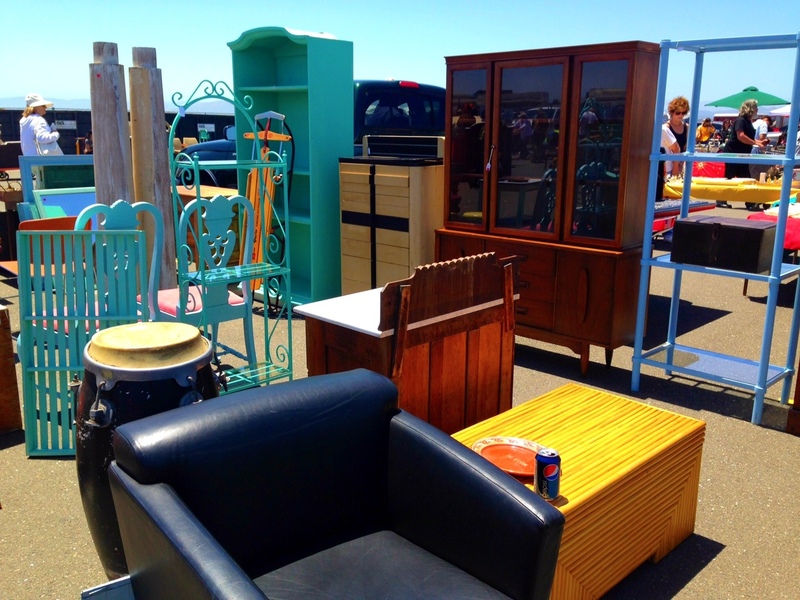 Makes me want to go flea market shopping again! Thanks! It really is an experience that no design lover should miss!! !